The facility offers a 200 m² room suitable for business meetings and private events, in a pleasant and functional setting; This space is surrounded by daylight and is attached to the patio, bar, restaurant and the secure outdoor parking lot. Seminars and Conventions package ! 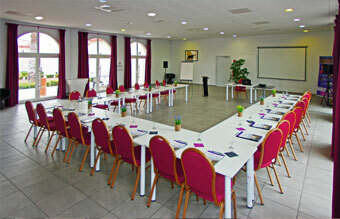 In addition to the rental of our meeting room and its facilities, we offer you a global package with catering, entertainment of your evenings, relaxation areas (swimming pools, spa, ...) and quality accommodation (hotel and/or villas) in a green, quiet and easy to reach in little Camargue. Contact us +33 4 66 806 400 ! Our meeting room can accommodate up to 200 people in theatre or cocktail, 150 people sitting, 40 in "U", 70 in class. It is also possible to open sub-commission rooms for 8 to 10 people. This space is also suitable for private meetings: wedding banquets, family events, ... It allows you to accommodate 120 people seated at the meal (100 if you plan a dancing animation). The staff of the Jasses de Camargue provide you with logistical assistance for the organization of your events. Our catering team is at your disposal for the organization of meals, buffets, cocktails or aperitifs.